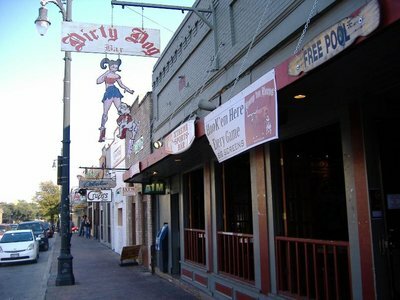 I am sitting at a high-top table in the Dirty Dog Bar at 505 East 6th Street in Austin, Texas, just a mere 10 blocks from the Texas state capitol building, sipping on a pint of Dos Equus and watching the University of Texas Longhorns Football team playing the Rice University Owls. Off to my left, a band is preparing to play a set once the game finishes. I look around at my fellow patrons. Beside me, a couple beautiful blond co-eds from the University of Texas are watching the game intently. At the end of the bar, a guy in a button down shirt works on his laptop, probably one of the many high-tech or bio-tech workers in the region. Closer to the stage, a few metal heads are chatting and drinking, waiting for the Dave Evans and his band to get started. Just then, three guys with Mohawks walk into the bar. None of the other patrons bats an eyelash. However, I’m not the one that called it weird, at least not originally. In fact, the citizens of Austin like their weird reputation, and some years ago started plastering their cars with bumper stickers imploring everyone to Keep Austin Weird. This weekend, while perusing the local free paper while eating breakfast in one of the many Mexican run restaurants in town, I read an editorial that was lamenting the covering of a local “non-commissioned outdoor art piece,” (i.e. graffiti) and how this was just one more move away from Weird Austin and towards the “Dallasifaction” of the city. Austin is a very diverse place. If people know Austin, most likely it is because of the University of Texas in Austin. 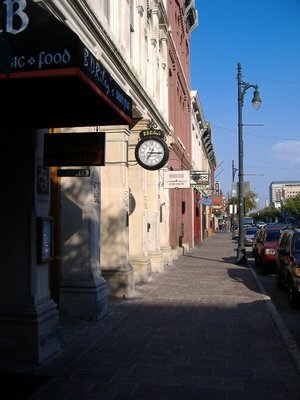 The University is one of the larger ones in the country, and is situated on a beautiful campus north of Downtown Austin. The most famous building on campus is the huge tower attached to the main building. 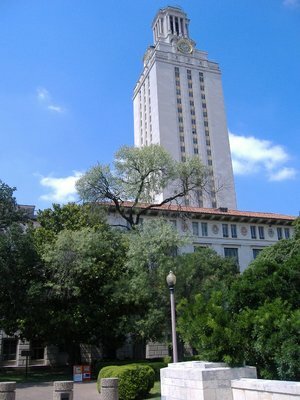 Architecturally beautiful and visible from most places on the campus and in various places across the city, the tower is also site of one of the more infamous campus shootings in American history, when on August 1, 1966, architectural engineering major Charles Whitman barricaded himself in the tower with a rifle, killing 14 people and wounding 31 others. The stand-off ended 96 minutes later, with the police storming the observation tower and killing Whitman. The incident notwithstanding, most North Americans would know the University of Texas from watching college sports. The Longhorns basketball team is a perennial contender in the NCAA “March Madness” basketball tournament. The big draw though, is the Longhorns football team. 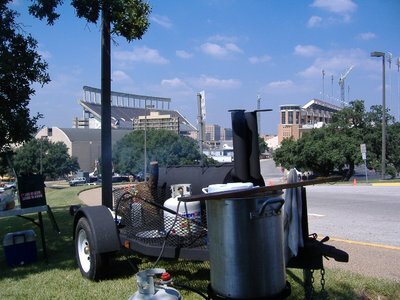 On Saturday, September 22, the Longhorns faced off against the Rice Owls. The game was not expected to be much of a match. Rice is an “Ivy League” school, more known for its academic achievements than its sporting traditions. Rice is, however, proud of the fact that all of the team doctors are Rice graduates and former football players. The tailgate party is the pre-game ritual of football fans across the United States. In Texas, they pull up in everything from small cars to massive RVs, usually with a few bumper stickers declaring that they “Bleed Burnt Orange” (the colour of the uniforms that the University athletes wear) or beseeching the Longhorns to “Hook ‘Em High” on the horns of the bull that is the University of Texas’ mascot. The tailgate party can be as simple as a charcoal barbeque and a cooler to beer, up to satellite TV dishes, flat screen TVs and massive BBQ smokers to slow cook ribs all day well prepping for the game. I listen to Dave Evans warm up for a bit, but decide to head out into the night air. I’d been walking all day and in addition to my Dos Equus, the bar has been handing out orange Jello shots each time that the Longhorns scored, and against the porous Rice defense, they were scoring a lot. All the vodka was going to my head. I head out into the night, and wander over to Congress Avenue. I look to my right, and perfectly framed at the end of the street is the Texas State Capitol building. 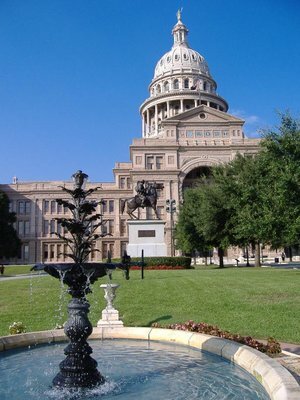 Austin is the capitol of Texas, the history of how it became the capitol I covered (most likely with incorrect and inappropriate details) in a blog entry on my last visit to Austin in 2001 called 38 year old grandmother strippers and American Born NHLers. If you scroll about half-way to the bold title “Capitol Music,” you can read about how I surmised that moving fatigue is what landed Austin the title of Texas capitol. The capitol being in Austin, though, means that the city is home to many government workers, not to mention the politicians. Turning right, I see some shiny glass buildings, and am reminded that back in 2001 this area was called the “Silicon Hills.” Austin is in Texas Hill Country, a lush and rolling area of Texas that is nothing like the image of endless cattle ranches or dust farms that we often see on TV. Back in 2001, over 100 high tech companies had set up shop in Austin, including IBM, Tandem, Schlumberger, Motorola, AMD, Apple and Texas Instruments. Even though the Internet Bubble has burst since I was last in town, there is still a presence here of technology, from computer circuits to genes, the companies range from computer equipment manufacturers to bio-technology companies. I watch a couple of goth kids wander by me, on their way to catch some band no doubt doing covers of My Chemical Romance, and think what a strange mix of people that inhabit this city: Frat Brothers and Sorority Sisters from the University in the same bars as the alternative rock fans; Mexican service workers enjoying a drink after their shifts, sitting next to bio-tech professionals drinking away the stresses of the day; country musicians grabbing a smoke before going on to perform for a crowd of government bureaucrats; smarmy politicians coming into town on occasion to sleep through sessions of state legislature; and all of it in a downtown core that doesn’t take more than 20 minutes to cross on foot. Austin is weird, in the best way possible. Hopefully they do keep it that way.